Greenery has played a great wedding role in the year 2017, and as predicted, will continue to be a popular wedding trend for the coming 2018. Greenery is an easy way for brides to save money in their budget and looks classic and chic. From cascading eucalyptus and swags of fern to statement light fixtures covered in vines, we love seeing how simple greenery can elevate (quite literally!) your wedding reception and ceremony décor. We’ve picked out some awesome ideas for you to use greenery and save money in your 2018 weddings! Check this out now and enjoy! Pairing lots of greenery with one solid color really makes greenery have a purpose. Any color will do, but softer tones and neutrals really help the greenery stand out. They look so simple, but they really make a statement at your ceremony, and what’s even better, they help you and your groom stand out! Using greenery for centerpieces (or adding it a few flowers) really makes a statement, especially when done on top of a neutral colored table linen. Not only are they affordable, they don’t wilt easily, so they look fresh from the first picture and far past the end of the night. The key with greenery is to have a lot of variety, shades, and textures! Your florist knows what works well and what will give you the best look on the big day. 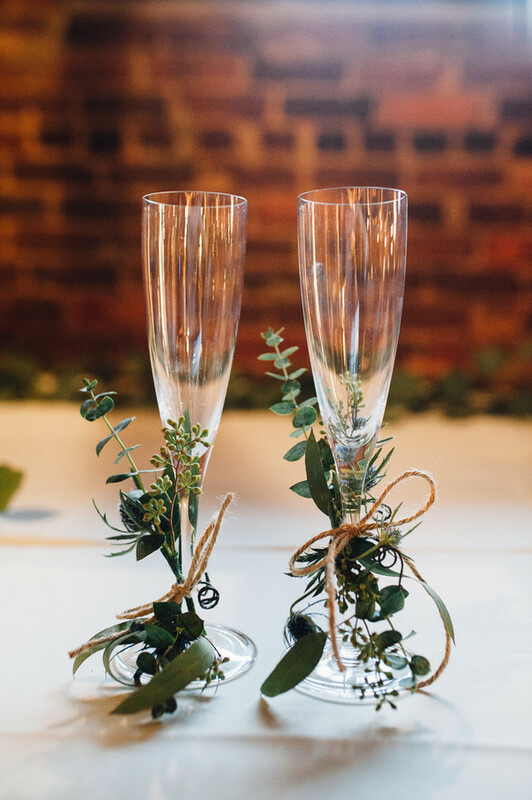 Simple little toasting flutes suddenly become themed with a little touch of greenery. It’s adorable AND special…win, win! This entry was posted in 2018 wedding trends, Greenery Wedding Colors, greenery wedding ideas and tagged 2018 wedding trends, greenery wedding ideas. Bookmark the permalink.